Works published in Physical Review Letters on July 21, 2017. (IRPHE, CNRS/Aix Marseille Université/Centrale Marseille). Left: simulation of a cubic parcel located in the liquid core of a planet disturbed by tidal effects. By focusing their electronic analysis on this reduced domain, researchers have accessed regimes similar to planetary regimes. The flow takes the shape of superimposed waves that interact non-linearly until forming three-dimensional wave inertia turbulence (see vertical vorticity field in the center), by contrast with models where flow becomes larger-scale turbulence structures aligned with the axis of rotation (see vertical vorticity field on the right). Veritable shields against high-energy particles, planets' magnetic fields are produced by iron moving in their liquid core. Yet the dominant model for explaining this system does not fit the smallest celestial bodies. Researchers at the Institut de Recherche sur les Phénomènes Hors Equilibre (IRPHE, CNRS/Aix Marseille Université/Centrale Marseille) and the University of Leeds have proposed a new model suggesting that turbulence in the liquid cores is due to tides produced by gravitational interactions between celestial bodies. 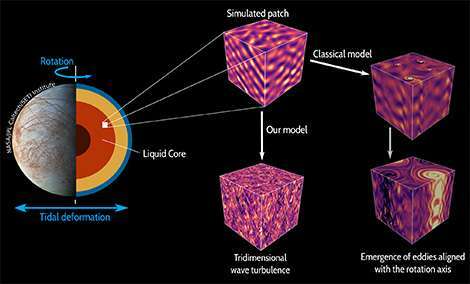 The model infers that instead of being due to large, turbulent molten iron vortices far from the surface, movements in the core are due to the superposition of many wave-type motions. This work was published in Physical Review Letters on July 21, 2017. Scientists agree that magnetic fields form and remain due to iron flowing in the liquid core. Discussions become more complicated when they attempt to determine what allows these colossal masses to move. The dominant model is based on the slow cooling of celestial bodies, which causes convection, which in turn creates large vortices of molten iron parallel to the axis of rotation of the celestial body. But small planets and moons cool too quickly for a magnetic field to be maintained there by convection several billions of years after they form. Researchers at IRPHE (CNRS/Aix Marseille Université/Centrale Marseille) and the University of Leeds have now presented an alternative model where it is gravitational interactions between celestial bodies that disturb the core. Tides, produced by these gravitational interactions, do indeed disturb the core periodically and amplify wave movements naturally present in the rotating liquid iron. This phenomenon ends up producing a completely turbulent flow, whose nature is not yet well understood. To study this, researchers used an numerical model of a small parcel of a planetary core, rather than simulating the core as a whole, which would require too much calculation power. This approach allows fine characterization of the movements created in extreme geophysical regimes, while retaining the essential physical features. The researchers have shown that turbulence is the result of the superimposition of a very high number of wave movements that permanently exchange energy. This specific state, called wave turbulence, can be seen as analogous in three dimensions to the movement of the ocean's surface, far from shores. This work opens the path to new models that allow better understanding and prediction of the properties of the magnetic field of celestial bodies. This tidal model would apply to all orbiting bodies that are sufficiently disturbed by neighboring stars, planets or moons. References : Inertial wave turbulence driven by elliptical instability.